Plastic mulch and trickle irrigation are expensive. Re-using the mulch for a second crop after the first can be an effective way to spread the cost. When the cost of supplies and labor are evaluated, re-using a field with trickle irrigation and black plastic mulch is an attractive idea, but weed control can be a problem. 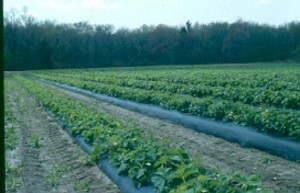 The herbicides used under the plastic and between the rows of mulch for the first crop must be safe and labeled for use in the second crop. Prefar applied at 6 quarts per acre in a band when the mulch is laid is a good choice for under the plastic. Prefar is labeled for many vegetable crops. Note that Prefar is no longer labeled for tomatoes. Prefar and Gramoxone plus NIS (nonionic surfactant), applied as a shielded banded spray between the rows of mulch, are also labeled for a wide range of vegetable crops. Be sure post plant applications of Gramoxone plus NIS are shielded, applied at low pressure, and a low drift agent is used. Often the greatest challenge is eliminating the first crop and any weeds in the field prior to planting the second crop in the mulch. No herbicide should be sprayed broadcast over the mulch except Gramoxone, which is quickly broken down by sunlight. Roundup and other glyphosate products should NEVER be used on plastic mulch. Unlike Gramoxone, glyphosate has no residual activity due to strong and immediate adsorption by the soil where it is slowly broken down by soil microorganisms as a food source. On plastic mulch without contact with the soil, glyphosate becomes a residual herbicide that does not easily wash off the plastic with rain or irrigation. The simple act of letting the root ball touch the plastic during transplanting can expose the crops roots to enough glyphosate to cause lasting injury and crop loss! 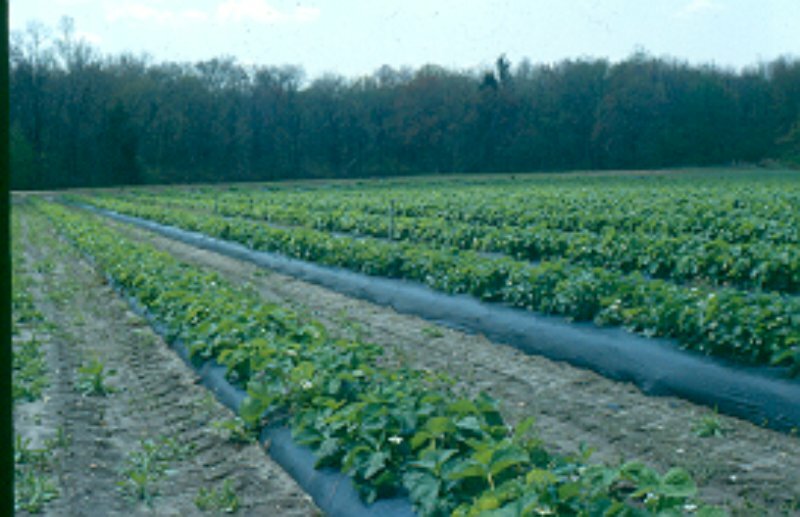 Residual herbicides must be banded between the rows of plastic mulch, never sprayed broadcast over the mulch. A typical planting hole may have a diameter of 2 inches, or a radius of 1 inch. The area of a circle is the radius squared times 3.14. One squared is 1, times 3.14 equals an area of 3.14 square inches. One square foot is equal to 144 square inches (12 X 12 = 144). If the herbicide from 1 square foot of plastic washes into the 3 square inch planting hole, the rate is equal to 144 divided by 3 or about 48 times the intended herbicide rate. Good crop safety should never be expected from any herbicide at 48 times the intended rate! Keep residual herbicides off the plastic mulch. In summary, the greatest weed control challenge in re-used plastic is weeds growing under and through holes in the mulch. Gramoxone is broken down by sunlight, so it can be used to kill the first crop and emerged weeds. Consider fumigating under the mulch with a water soluble fumigant injected through the trickle irrigation to provide weed control in the second crop. Disease control may be another added benefit. Remember to wait until the fumigant has dissipated before planting.